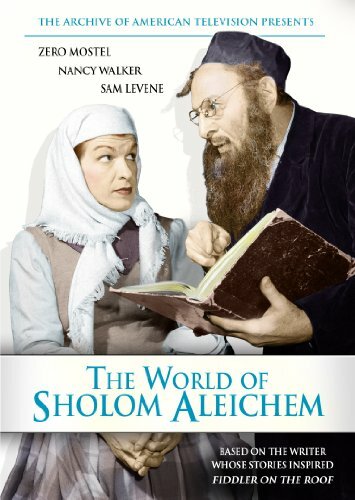 Adapted by Arnold Perl from his 1953 Off-Broadway play, The World of Sholom Aleichem was first broadcast on December 14, 1959 on the dramatic anthology series The Play of the Week. This compilation of three different plays was based on the stories of Sholom Aleichem; the famed writer known as the Yiddish Mark Twain. The first play "A Tale of Chelm," features Zero Mostel as a befuddled religious teacher and Nancy Walker as his exasperated wife in a lighthearted tale of a man trying to buy a goat in a town of fools. "Bontsche Schweig" takes place in heaven where the newly deceased Bontsche (Jack Gifford) has arrived for judgement. After an angel (Lee Grant) tells the story of his life of strife, Bontsche is offered paradise, only to stun the heavenly court with an extraordinarily modest request. In the final play "The High School," a Jewish merchant (Morris Carnovsky) is cajoled by his wife (Gertrude Berg) to help prepare their teenage son for high school in spite of quotas designed to limit the number of Jewish students. If you have any questions about this product by Entertainment One, contact us by completing and submitting the form below. If you are looking for a specif part number, please include it with your message.